Bertrand Arthur William Russell was a British philosopher, logician and social activist born on May 18, 1872, at Trelleck Wales, in the United Kingdom. Sadly, by the time he was four years old, Russell's parents, Lord Amberley Second Earl Russell and Kate Stanley, daughter of the second Baron Stanley of Alderly, had died. This left him to be raised by his stern, Unitarian grandmother who had him educated privately until he entered Trinity College, Cambridge with a scholarship in mathematics. As many philosophers before him, from mathematics he transitioned to the study philosophy. 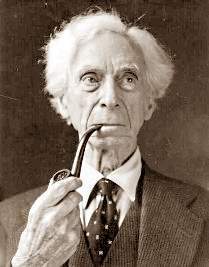 Bertrand Russell is largely credited as being one of the founder's of analytic philosophy. Some of his most influential contributions were to mathematical logic and the philosophy of logic. Along with Alfred North Whitehead he wrote Principia Mathematica (1910), a three volume work in which he explains his theory of mathematics and the view that mathematics is simply logic. He also developed two theories, the 'theory of types' and the 'theory of descriptions,' in which he took on the problems of relating to truth, meaning and belief. Russell considered his 'theory of descriptions' to be his most important contribution to philosophy. In it he solved a long standing philosophical quandary which deals with the semantic problems of meaning and reference. The quandary arises out of considering whether to call a sentence true or false when it fails to refer. Take for example, the phrase: 'The present King of France is bald'. Since there is no such person as 'the present King of France', can such a sentence be considered false or meaningless? To take either position presents a problem. To say that it is meaningless disregards the fact that the sentence is making a reasonable assertion. However, to say that it is false would mean its contradiction, which is that 'The present King of France is not bald' is true. Evidently, the second statement is no more true than the first one, so how can we settle the analysis of sentences that fail to refer in this manner? Russell resolved it brilliantly. He proposed that such sentences are actually descriptions which consist of a conjunction of separate claims. That is, first of all, there is some person who is the King of France, and secondly, there is only one person who is the King of France, and thirdly, any person that is the King of France is bald. Now each these propositions can be properly settled because they amount to a conjunction in which the first proposition is false (that there is a present King of France). Logically, any statement that is a conjunction of propositions is false if any one of the conjuncts is false. Russell's theory of descriptions, in showing how it is possible to speak meaningfully of things that do not exist, has become central in logical analysis. Without his analysis, assertions about non-existents would be problematic. Amongst his works, Russell's The Problems of Philosophy (1912) is still among the most popular books of philosophy. It is widely regarded as a classic introduction to philosophy and philosophizing. His A History of Western Philosophy (1945) is probably his best know work and a clear, masterful treatment of the whole of Western Philosophy. Bertrand Russell made significant contributions, not only to logic and philosophy during his long, esteemed career, but to a wide range of subjects including education, history, the sciences and humanities, as well as political theory. He saw a clear important connection between education, in the broad sense, and social progress. For Russell: "Education is the key to the new world...Partly this is due to our need to understand nature, but equally important is our need to understand each other." After a life marked by controversy, not the least of which was his anti-war activism and his outspokenness over nuclear disarmament, Russell was awarded the Order of Merit in 1949 and the Nobel Prize for Literature in 1950 ("in recognition of his varied and significant writings in which he champions humanitarian ideals and freedom of thought"). He remained a prominent public figure until his death in 1970 at 97 years of age.